Find the perfect place to work on your backhand with our comprehensive list. Love means nothing in tennis, but it does help to find a court you love. Thankfully, there are plenty of public tennis courts scattered across Boston, from the North End to Hyde Park. We’ve listed out 50 here, and organized them into categories: courts in Boston, Brookline, Cambridge, Somerville, and ones just beyond the city. Picks in Boston are listed alphabetically according to neighborhood. Almost all of the courts are free to use, with the exception of a couple of top-notch spots that call for court rental fees. But the rest of ’em are wide open for novices and pros alike to practice serves and crush a few sets. Use our handy key to search for what matters most to you. Game, set, match! 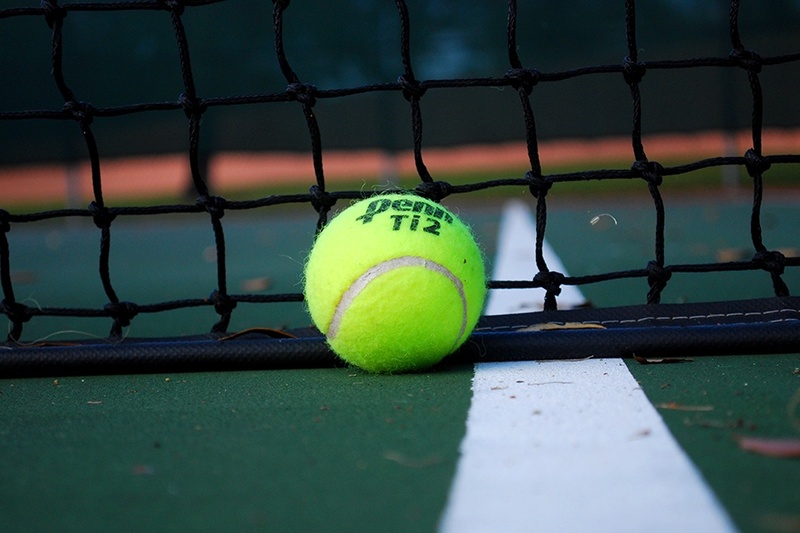 Control- or Command-F your way through our list to find a tennis court in your neighborhood. 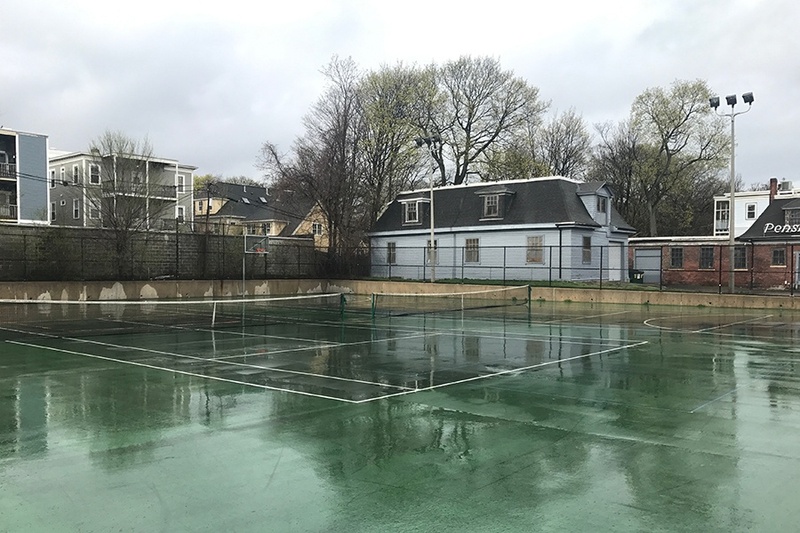 This MBTA-accessible tennis court is located inside Allston’s Ringer Park, which also features basketball courts, a turf playground, and a baseball diamond. Find it off of the Allston Street or Packard’s Corner stops, or make use of the parking lot and travel by car. 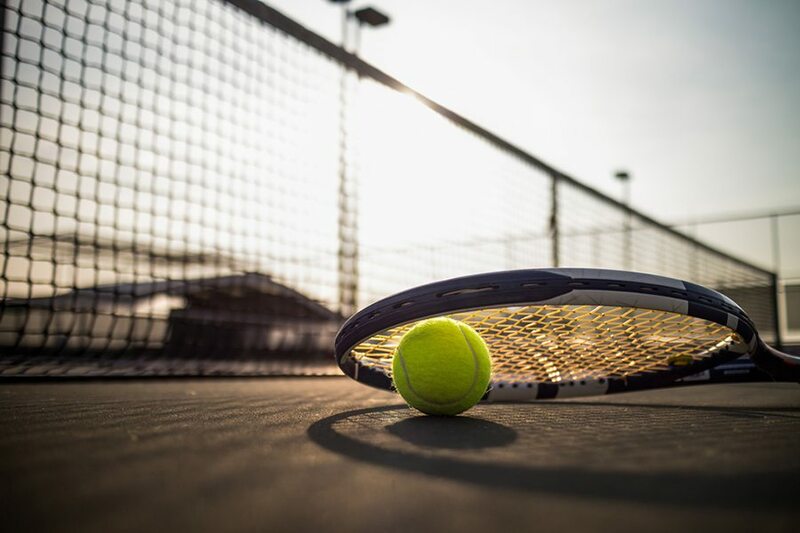 These two tennis courts are smack dab in the middle of ever-bustling Boston Common, which makes them the perfect spot to show off your skills to passersby. The good thing? They’re only a short walk from the Arlington or Boylston Green Line stops. The bad thing? There are only two courts, so come prepared to wait. Rogers Park in Brighton is located next to Chandler’s Pond and the Cenacles Park. Its courts are well-lit and right next to a baseball field. In case you’ll be needing a caffeine break, there’s also a Starbucks a short walk away. 30 Rogers Park Ave., Brighton. Tucked behind Charlestown High School and set against an urban backdrop, this tennis center is Charlestown’s best-kept secret. Built for tennis enthusiasts both young and old, the center is open seven days a week with three courts for use. Rentals start at $20 per hour. Part of Boston’s Emerald Necklace, Dorchester Park has over 30 acres of lush green foliage and an expanse of activities available, including two tennis courts, a baseball diamond, and a playground. After you play a few matches, cool off by wandering the mini forest pathways of the park. If you’re looking for a more relaxed game, this park is worth heading to. With two tennis courts and a playground, Ripley looks past the bells and whistles of a large tennis center, and instead allows for fun matches in a small neighborhood setting. The perfect escape from the bustle of the city, this park is tucked on a side street near Dorchester Bay Basin. 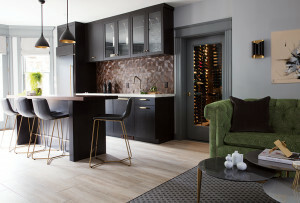 Plus, it’s only a five-minute walk from Savin Hill station. When you’re finished up hitting around, there are some short hiking trails to the top of the hill. This park is perfect if you want to immerse yourself in the outdoors, but still have a view of the cityscape. With two tennis courts and a baseball diamond, East Boston Memorial Park offers plenty to do and see, and is conveniently located near the Airport T station. 143 Porter St., East Boston. A hidden gem in East Boston, this park is a haven for locals looking for a friendly match of tennis along the water. Porzio Park is surrounded by several other Eastie parks, including the Massport Harborwalk, where you can take a stroll after a heated match. 598 Sumner St., East Boston. If you’re looking for a night match, Iacono has you covered with two lit tennis courts. 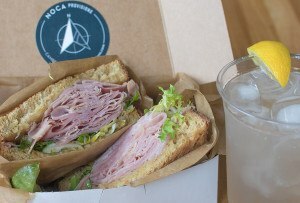 Located in Hyde Park, the spot also has basketball courts, picnic benches, and a playground. Need to cool off after your game? Iacono Playground has a refreshing splash zone area by the playground. 150 Readville St., Hyde Park. Comprised of a big field with four baseball diamonds, two basketball courts, and a tennis court, this Hyde Park complex has plenty of space to spread out. The single court is lit and laykold, making it perfect for a family outing or practice session. 145 Westminster St., Hyde Park. Spanning 4.1 miles from Back Bay to Forest Hills, the Southwest Corridor boasts a total of five tennis courts. This spot in the Jamaica Plain stretch of the park has two tennis courts, and is surrounded by JP’s colorful Victorians and three-deckers. New Minton St., Jamaica Plain. Just off JP’s main thoroughfare, Centre Street, these South Street courts are in a prime location. There are technically two courts, but one of them can also be set up as a basketball court. These lit, laykold courts are often used by big groups and families (especially in the summer) so it might not be the best place to go if you’re really trying to work on your game. 52 South St., Jamaica Plain. If you’re looking to play a big group game, these courts are a great option. Three of the four courts are lighted, and there’s plenty of street parking available. 20 Williams St., Jamaica Plain. These three courts sit next to a football field and basketball courts, all of which are surrounded by various walking paths that wind through a wooded area in Mattapan. This community center in Mission Hill has various outdoor components, including a lit and laykold tennis court. It’s right off busy Columbus Avenue, so there’s a bit of noise from traffic, but plenty of shrubbery protects the court from the street. 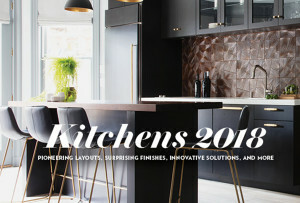 10 Lamartine St, Mission Hill. Tennis with a view? These lighted courts overlook the harbor along the North End waterfront. They’re a hop, skip, and a jump from the Freedom Trail, if you’re up for a history lesson after your match. 561 Commercial St., North End. Just off of Washington Street in Roslindale, Fallon Field pops up right between South Street and Belgrade Avenue. This lit and laykold court is the only one in the surrounding area, so be prepared to wait for courtspace. There’s a baseball field, a playground, a floor hockey court, and a basketball court to utilize while you’re waiting, though. There’s a lot packed in to this one little area on the border of Roxbury and Dorchester, with a lighted court right in the center of it all. If a little background noise won’t mess up your game, this could be your new go-to spot. Franklin Park has no shortage of attractions. From the zoo to a 10,000-seat stadium, there’s plenty to do. It also has two courts padded with a line of trees on one side. Right off MLK Jr. Boulevard sits Malcolm X Park. Its courts are lighted and surrounded by trees, which offer some shade on a really hot day. 150 W MLK Jr Blvd., Roxbury. Less than a 10-minute walk from the Jackson Square T stop, this lit and concrete court is just down the road from Highland Park and Roxbury’s Fort Hill Tower. So, after working on your backhand, you can head to the hill to get an excellent view of the skyline. This skinny strip of parkland features three basketball courts, a green area, some play areas, and two lit, concrete tennis courts. It’s right behind the Boston Police Headquarters, and is popular with Northeastern students. This park is located right where South Boston meets the water. Steps away from the beach on Pleasure Bay, Marine Park has a lit, laykold tennis court with views of the harbor. 49 Farragut Rd., South Boston. Another waterfront hangout, Joe Moakley Park is a massive property, measuring about half a mile long. Three laykold courts are partially surrounded by trees with a nice view of Carson Beach and the harbor. 1005 Columbia Rd., South Boston. Peters Park sits in a quiet area of the South End, a bit removed from busy Tremont Street. The lighted court has two adjacent backboard courts, perfect for practice in between a match, or even for a solo game. 1277 Washington St., South End. At the edge of the South End, the grass and courts at Ramsay Park have probably seen better days. If you don’t mind some scuffs and scrapes to your tennis court, this is a great location to spend the day practicing serves. It has two lit, concrete courts with ample opportunity for shade breaks from the surrounding trees. 1917 Washington St., South End. 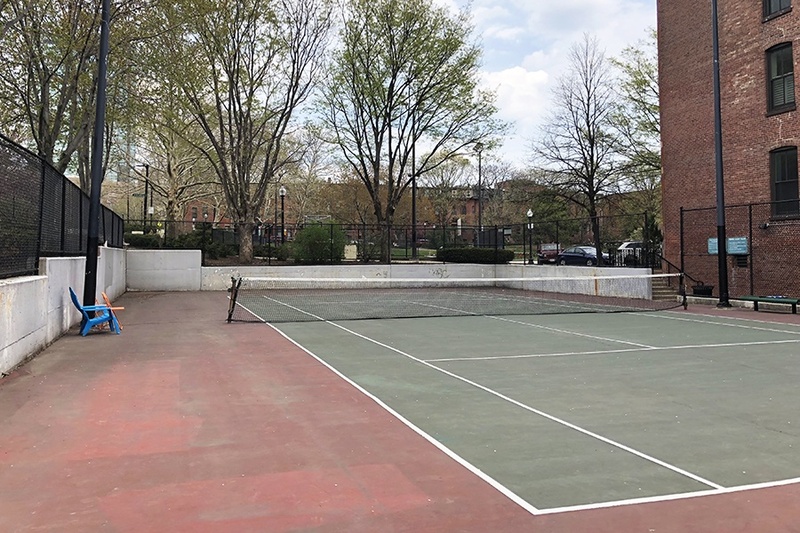 You’ll find this tennis court along the Southwest Corridor, tucked between the park and a classic South End brownstone. There’s only one court here, so expect to wait. 76 Claremont St., South End. These courts might rival the Common for Boston’s most scenic, as they are located right along the Esplanade. It’s a bit of a trek if you choose to walk along the river to get there. There’s parking if you’d rather throw your rackets in the back seat. 251 Causeway St., West End. 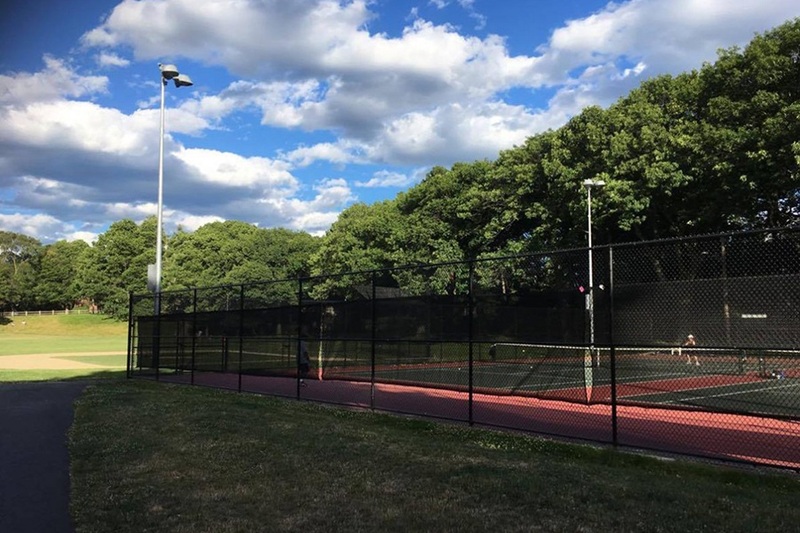 Situated right next to the George Wright golf course in West Roxbury, these courts are not too far from the Stony Brook Reservation in Hyde Park. Adjacent to the courts are two baseball diamonds and a soccer field. There isn’t any overhead lighting, so it’s best to get in a game before sundown. 267 Reservation Rd., West Roxbury. Billings Field is a huge property right at the edge of West Roxbury. Of the three laykold courts, one is lit and there’s an additional half court with a backboard. There are plenty of bus stops in the area that are on the 35, 36, 37, and 38 routes. The spot is also close to the West Roxbury commuter rail stop. 380 LaGrange St., West Roxbury. These six clay tennis courts are located in the busy (and incredibly dog-friendly) Amory Park in Brookline. Pay a few dollars to use the Amory Park Tennis Center, which has a restroom and changing area, scoring cards, instructional programs from adults and juniors, and drop-in matches all weekend long. 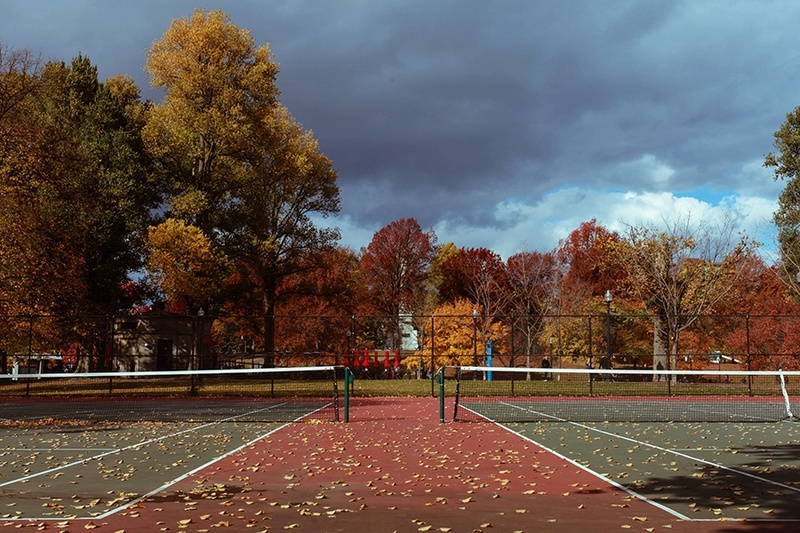 The tennis courts at this Brookline park were originally created in 1918, and have seen countless tennis and croquet tournaments over the years. Now, the park boasts eight new courts ready to be played on. Though Longwood Playground is a public park, the playground is where kids from the Lawrence School play during recess. Find three well-maintained courts at the eastern edge of the playground. 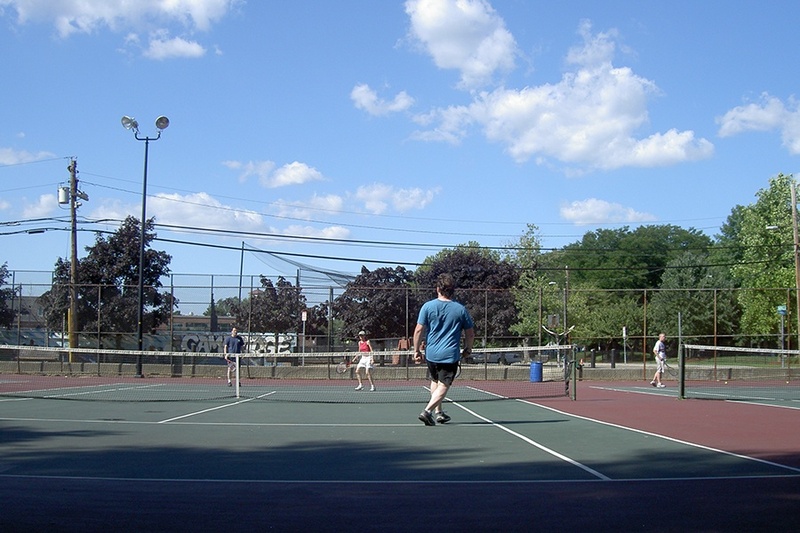 Maintained by the Brookline Recreation Department, these courts are located near the Chestnut Hill Reservoir and are known to be less crowded than other Brookline courts. Factor in the 10 minute walk from the Reservoir T stop to your playing time, or search for street parking in the nearby neighborhoods. The playground itself is one of the three largest playing fields in Brookline. Across the river in Cambridge, find one of Boston’s largest tennis centers: the MIT DuPont Outdoor Tennis Courts. Part of the MIT’s athletic facilities, the twelve courts are located only two blocks from the river and the Charles River Bike Path. However, if you want to play on them, you’ll have to reserve court space two days in advance, which can be done in-person or over the phone. Rental rates start at $25 per hour and vary by date and time. 133 Amherst Alley, Cambridge (MIT Building W53). This singular court is located next to Harvard University. Interested players don’t need to worry about court reservations, because the court is open to anyone and everyone, at all hours. The court is unlit, however, so make sure to schedule your playing times during the day. This Cambridge court near MIT is a part of a larger park, featuring a children’s playground and public art installations. The courts were renovated in 2008 and have since become a popular neighborhood hangout, so be prepared to share court space on the weekends. Not far from the banks of the Charles, these two tennis courts are neighbored by Hoyt’s baseball field. The courts are not lit, so a visit during the morning or afternoon might be your best bet. These tennis courts underwent a renovation in 2015, and come complete with brand new tennis nets that are still in top-notch shape a few years later. Street parking makes the courts car-accessible, but if you opt to take the T, factor in 15 more minutes of exercise to walk from Porter Station on the Red Line. Right along the Charles River, Riverside Press Park is the ideal summer spot to practice your strokes. The large park also offers a basketball court and a playground, making it perfect for an outdoor family outing. A hot spot of the summer for Somerville residents, Dilboy Park is equipped with a lot more than the two laykold courts. A stadium, pool, full-sized baseball diamond, and green space are in use all summer long. 100 Alewife Brook Parkway, Somerville. Another Somerville treasure, Foss Park is jam-packed with activities. It’s located right off the Northern Expressway and close to the Assembly stop on the Orange Line. Overlooking the Mystic River in Chelsea, this riverside park has two tennis courts, along with a playground and scenic viewing area. After a long day’s tennis match, head to the picnic area to rest and enjoy the waterfront views. Cunningham Park flaunts all the summertime essentials: two asphalt tennis courts, a pool, baseball diamonds, and a large green space. Pool entry comes with a fee, but the tennis courts are all yours, all summer long. 75 Edge Hill Rd., Milton. This 65-acre green space is the perfect place to get away from it all. A huge park accompanies three concrete courts with a parking lot, and if you get hungry mid-match, it’s just down the road from Whole Foods. Here, six concrete courts are split between two sides of a huge field with baseball diamonds. We recommend driving to McGrath Park, as it’s tough to get to via public transportation. These five lighted, concrete courts are right on the edge of a large forested area adjacent to Quincy High School. The public courts are fenced-in, and offer plenty of room to spread out. Five lit, laykold courts lay at the edge of Victory Field in Watertown, home of the Watertown High School Raiders. Great for group games, these courts are just over the Charles. There’s plenty of parking available. Just a block from the Charles River, Casey Park has two lit and laykold courts as well as basketball courts and a baseball field. There’s also a playground on the property, so it’s an ideal spot for a few matches if you want to bring the whole family.